Tony Stark is a resourceful man. Wounded, captured and forced to build a weapon by his enemies, the billionaire industrialist instead created an advanced suit of armor to save his life and escape his captors and became known to the world as Iron Man! You don't have to build an iron super -suit to be as resourceful as Tony. 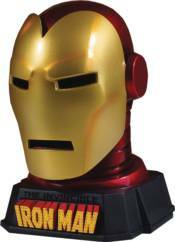 You just need to pick up the new Iron Man Helmet Desk Accessory. This unique, conversation-starting piece comes in the shape of Iron Man's classic helmet and could be mistaken for a piece of art, but it contains secrets! It features two secret compartments: the first a drawer in the base large enough to hold business cards, the second is a chamber hidden behind the faceplate of the helmet. Inside the hidden compartments, you can store your push pins, post-it notes or miniature arc reactors. Each desk accessory is hand-cast, hand-painted, and hand-numbered with a limited edition Certificate of Authenticity.